Before you pick up a tool to work on your bonsai you should have a shaping plan. Someone who has practiced bonsai for years and has experience with the species of plant they are working on can make a shaping plan in less than hour. But for the beginner or casual bonsai practitioner who has not worked with a particular species before, the planning process should be much more involved. There are three basic steps to making a shaping plan; research, observation and selection. If the species of plant you intend to shape grows naturally in your region try and find full size examples in the wild in your area. If you are having trouble call a local arborist and ask if they know of public locations of your tree. Be sure to bring a camera and take lots of photos of the tree as a whole as well as branch patterns, trunk twist, anything that catches your eye. Keep the photos easily available to refer to as you make your bonsai shaping plan and for later in case you need inspiration down the road. Next, or first if your species does not grow in your region, look for images of full sized versions of your bonsai tree online, in books and/or magazines. Do not solely focus on photos, also look for artist renderings of the tree in painting, print or sculpture. Collect up as many quality images as you can and keep them available. Thirdly, repeat the previous process but this time search for bonsai versions of your tree. There are many bonsai photo galleries online with literally hundreds of picture of bonsai. Search specifically for photos of your species and remember, do not just look for photos. Other artistic renderings of bonsai can also provide inspiration which is the goal. Finally, search for local bonsai retailers or bonsai enthusiasts that might have living examples of your species in bonsai form. It may seem that this step should be first but there is a reason to save this step for later. By this time you will likely already be narrowing down your shaping plan. Be sure to bring any images you have collected in the previous steps that represent your still formulating shaping plan. Show the images to your fellow bonsai enthusiasts and ask their advice on shaping your species in your local region. Local experts are an invaluable resource since bonsai can behave quite different in different region and in different climates. Be sure to takes notes and keep them with your collected images for later reference. Look at your bonsai. Even immature trees are unique and have genetic strengths and weaknesses. Closely examine your tree and try and determine how it wants to grow. It has been said that you and your tree are partners with the goal being an exceptional bonsai. Observe your tree and try to determine how it thinks it should be shaped. It is finally time to make your choice. Gather all of the relevant images and notes you have collected throughout this process and lay them out on a table surrounding your bonsai. The first choice you need to make is the style you plan to use to shape your tree. There are two options which are often referred to as are koten and bunjin. But in essence you are deciding if you are going to follow the rules of bonsai or break them. Koten: The classical style of bonsai characterized by a trunk with a wide base that gradually becomes more slender toward the top. Koten is following the rules. In the simplest terms koten is all bonsai that is not bunjin. 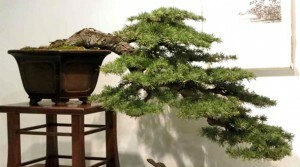 This style is almost universally consider a better choice for people new to bonsai. Bunjin: Also known as the comic or non-traditional style, bunjin bonsai break the normal bonsai rules. The essence of bunjin is freedom so it is difficult to define exactly what makes a bunjin tree. But thin wildly bent and contorted trunks and branches with limited leaves are common with bunjin bonsai. Many bunjin bonsai seem to present a tree that has been mightily abused and damaged but has somehow survived. Bunjin is generally consider much more difficult than koten, but if you have read much on this website you know that we are strong advocates of taking risk with your bonsai. Even if you are a novice, if you really think bunjin is the best choice we say go for it. Once you have decided on a style, revisited all of your gathered images and notes and reexamine your tree. Does your style choice change your image of how you want your bonsai appear? With this fresh on your mind it time to select a shape for your bonsai. There is no definitive list of all of the possible shapes of bonsai trees. Over the centuries there are countless examples of different bonsai shapes. We will deal with the five standard shapes which are the formal upright, the informal upright, the slanting style, the cascade and the semi-cascade. Formal Upright Shape: The classic bonsai form characterized by a symmetrical shape with the highest point of the bonsai centered directly above the center point of the base. The trunk is straight and the branches are longer at the lowest point and taper into a cone or oval shape to the highest point. Informal Upright Shape: The growth of the informal upright style is upward like the formal upright style but it takes a less direct path. The trunk zigzags on the way to the highest point or apex, but the apex is aligned with the trunk base. The largest branches grow from places where the trunk changes direction creating a balanced yet not completely symmetrical shape. Slanting Shape: Sometimes called a leaner, with slanting style the trunk grows at an acute angle to the base with the apex aligned off center. Higher branches grow in the direction of the trunk slant and lower branches grow in the opposite direction. Cascade Shape: The trunk in the cascade style starts to grow upwards but soon turns abruptly. The branches fall to the point that most of the foliage is below the soil level. The overall look is of a tree growing on severally sloped ground and being forced to grow away and downward from the base. Semi-cascade Shape: Like the cascade style, the trunk in the semi-cascade style turns abruptly after growing upwards. Unlike the cascade style the trunk does not continue to the point that foliage is growing below the pot. The trunk grows at an angle close to horizontal to the ground and most of the foliage is above soil level. Once you have selected the style and shape of you bonsai immediately make a sketch of how you expect to see your bonsai when mature. It does not have to be a work of art, but should include as many details as possible. If practical, laminate the sketch to safeguard it. Keep the sketch available for future reference as you are shaping your bonsai tree.